Even though Domaine Santa Duc has a long history for being one of the top producers in the Gigondas appellation, as well as being one of the biggest negociants in the Southern Rhone Valley, they are fairly new to Chateauneuf du Pape. The creation of Santa Duc dates back to 1874, when the fledgling company was founded.The seemingly odd name was not what the company was originally called. It was “Canta Duc,” which can be loosely translated to mean a singing owl. In time, the name morphed into Santa Duc. Santa Duc has remained a family run company. The company headquarters is located in Dentelles de Montmirail. Yves Gras, who was been in charge of Santa Duc since 1985 and he will be followed by the by his children as well. Domaine Santa Duc began purchasing vineyard land in the Chateauneuf du Pape appellation back in 2009, when they found a small, 1.23 hectare of vines. Since then, they have increased their holdings with further purchases in the La Font du Pape vineyard and in the top terroirs of the La Crau lieu-dit. Beginning with the 2012 vintage, Domaine Santa Duc, they were certified for being being biodynamic in their farming practices. 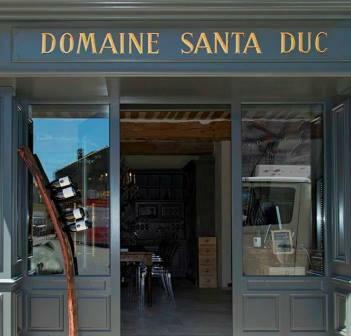 The first vintage for Domaine Santa Duc in Chateauneuf du Pape was 2010. By 2018, they owned almost 4 hectares of vines in Chateauneuf du Pape. Domaine Santa Duc produces 4 red, Chateauneuf du Pape wines. Domaine Santa Duc La Crau Ouest is made from 100%, old vine Grenache. The vines are at least 80 years of age and are planted in sand and clay terroir found in the la Crau Ouest vineyard. The wine is aged in Terracotta jars for 18 months before bottling. The production is quite small, as only 200 cases are produced here each vintage. Domaine Santa Duc Les Saintes Vierges is made from a blend of 90% Grenache, 9% Mourvedre and 1% Counoise. The terroir is pure sandy soil in the les Saintes Vierges lieu-dit. The wine is aged in foudres for 18 months. Domaine Santa Duc Habemus Papam – The name of the wine can be translated into “We Have a Pope.” This was done as an hommage to Pope Jean XXII, who was a native from Cahors, in the Northern Rhone Valley. It was Pope Jean XXII who became the first Pope to reside in Avignon. The wine is produced blending 64% Grenache, 25% Syrah, 10% Mourvedre and 1% Counoise. The terroir is sand, rock and stone soils in the la Crau, la Font du Pape, le Pied de Baud, Pradel and les Saintes Vierges lieux-dits. The grapes are whole bunch fermented. The wine is aged in foudres for 18 months before bottling. Domaine Santa Duc Pied de Baud comes from vines planted in the Le Pied de Baud vineyard. The wine is made with 100% Grenache. The grapes are not destemmed. The wine is aged vinified in cement tanks. The aging takes place first in demi-muids for 12 months and then for 6 months in cement vats. Production is limited as only 250 cases are produced each vintage. Domaine Santa Duc as we mentioned previously, is best known for their Gigondas where they produce: Gigondas 66, Gigondas Aux Lieux Dits, Gigondas Clos Derriere Vieille, Gigondas Cuvee Classique, Gigondas Grand Grenache 66, Gigondas Gauter Garrigues and Gigondas Prestige des Hautes Garrigues, which are all stellar wines. They also make wines in Vacqueyras, Rasteau, Cotes du Rhone and Cotes du Rhone Villages, as well as a fine value priced IGP and Vin de France. Domaine Santa Duc can be enjoyed on the young side. But the wine is better with some bottle age. Young vintages can be decanted for 1-2 hours allowing the wine to soften and open its perfume. Older vintages might need very little decanting, just enough to remove the sediment. Domaine Santa Duc is usually better with 3-5 years of bottle age. Of course that can vary slightly, depending on the vintage. In the best vintages the wine should be consumed within 5-15 years after the vintage. Domaine Santa Duc is best served at 15.5 degrees Celsius, 60 degrees Fahrenheit. The cool, almost cellar temperature gives the wine more freshness and lift. Domaine Santa Duc is best served with all types of classic meat dishes, veal, pork, beef, lamb, duck, game, roast chicken, roasted, braised, stewed dishes, sausage, barbecue and cassoulet. Domaine Santa Duc is also good with Asian dishes, hearty fish courses like tuna, mushrooms, cheese, pasta, eggplant and tomatoes. The white wine of Domaine Santa Duc is best served with a myriad of different seafood dishes, shellfish, crab, lobster, sushi, sashimi, chicken, pork and veal, as well as Asian cuisine. With a whisper of smoke, the spicy red fruit, licorice, peppery, earth and herbs are paired with red berries that are bright, vibrant and fresh. The wine offers a lifted, red fruit character in the finish. The wine was produced from 80% Grenache, 15% Mourvedre and 5% Cinsault. Flowers, black pepper, herbs and dark red fruits are the first thing you note, but not the last. Here, you also enjoy density, richness, length and supple textured, sweet, deep, red fruits that last. The wine was made from blending 64% Grenache 25% Syrah, 10% Mourvedre and 1% Counoise. Light on its feet, the wine is elegant, refined, soft and fresh, The fruits have energy. The tannins are gentle, allowing you to focus on the purity in the red fruits in the finish. The wine was produced from blending 90% Grenache, 9% Mourvedre and 1% Counoise. Offering silky textures, purity of fruit, vibrant, freshness and length. The kirsch shows a purity and freshness in its elegant nature. Give it a couple of years to fill out a bit more. The wine was made from 100% old vine Grenache from the La Crau lieu-dit, and was aged in terra cotta, Amphora jars. With a distinctive, floral, herbal and mineralistic edge, the red fruits are fresh, ripe and pure. There is a nice stony quality you can sense, that really adds to the sweet, cherry fruits. Medium bodied, soft, forward and crisp, with sweet, red fruits and earthy components. This should drink quite well on release. Full bodied, soft, silky and polished in texture, with a juicy center of fruit. Kirsch, cherry and wild strawberry all blend together with a melange of cracked peppers, rocks and a judicious hint of thyme in the cherry filled, end note. This is a producer I normally see from Gigondas, so it was fun to taste their Chateauneuf du Pape. Medium bodied, light in style, elegant, fresh and on the forward, bright, red berry side of the style range with a blast of thyme that comes though in the finish.